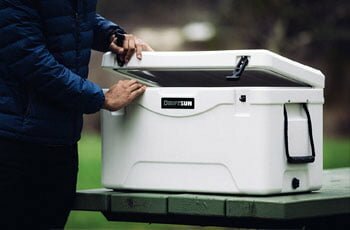 In this Driftsun cooler review, we’ll take a look at all the sizes/models they currently have available, what their prices are, how they perform, and how they compare to some of the top names like YETI and Pelican. If you’ve been a bit lost trying to find information on a Driftsun coolers, join the club. Up until about several weeks ago, we’d never heard of the brand before. As it turns out, the company is pretty well established in the realm of boating and summertime beach toys – they manufacture a complete line of kneeboards, hammocks, lounge chairs, standup paddleboards, and even clear-bottom kayaks. So, we guess it’s only natural then that they decided to jump into the rotomold ice chest market, given the importance of coolers for summertime activities, and given the fact that pretty much every other brand has their own line of performance ice chests these days. The first thing we’ll say about Driftsun ice chests is that their quality surprised us. Considering the fact we’d never heard of them before and they have little to no marketing/advertising, we assumed it wouldn’t be too much of a review. As it turns out, though, the coolers really aren’t half bad – and the best part is that they’re inexpensive. Like we mentioned in the intro, Driftsun manufactures a wide range of summertime ‘adult’ beach toys – they put hardly any emphasis at all on their image or brand name, so in that regard they’re kind of the opposite of YETI who’ve become the undisputed image kings of the outdoor lifestyle. 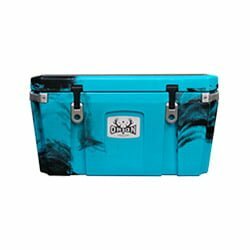 However, if things like image, reputation, and brand names aren’t important to you (or if you just like saving a lot of money) then you might really want to consider a Driftsun – they’re about half the price of other rotomolded coolers, and they perform pretty well, all things considered. 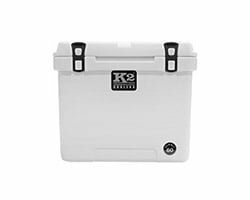 Just like YETI and all the other top names, Driftsun coolers are built with rotomold technology and have about 2” of industrial grade insulation sandwiched between the thermoplastic inner and outer layers. They’re tough, durable, and you can expect them to hold ice for about 3-5 days. Driftsun’s lineup of rotomolded ice chests is called the Arctik Series (no that’s not a typo), and they’ve currently got four different sizes available: a 25-quart, 40-quart, 60-quart, and 85-quart. 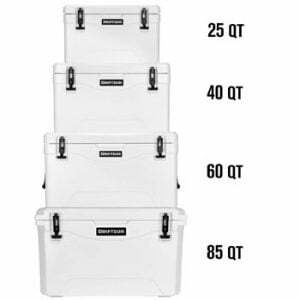 Each different size is available in either tan or white, and the coolers have a full 1-year warranty (not the best in the world, but not too bad for an inexpensive ice chest. Other similar brands have only a 60 or 90-day warranty). 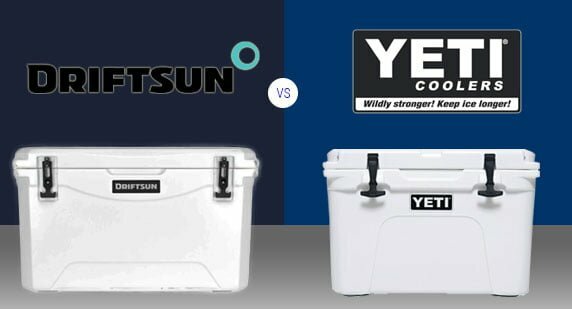 As far as prices, on average Driftsun Coolers are about 40% cheaper than YETI. They’re very comparable in price to RTIC, but the good thing about them is that you don’t (at the time of this writing at least) have to worry about them being backordered. What are people saying about Driftsun Ice Chests? In the past several weeks there have been more and more reviews on Amazon for all sizes of Driftsun coolers, which is the best proof that word is starting to get out about the brand. Reviews have come out strong and are really positive so far – an average of over 4 stars out of 5 for all different sizes. Several people actually came right out and directly compared their Driftsun to a YETI they previously owned, and almost all of them claimed that the Driftsun kept ice just as long. Also, most of the reviews are pretty new but plenty of people commented as well on the build quality, saying they don’t see any reason why it shouldn’t last for years and years to come. Ever since RTIC rocked the market by introducing YETI-quality coolers at half the price, people are ever on the lookout for new, quality brands like Driftsun that seemingly pop up out of nowhere and offer heavily discounted rotomold coolers. RTIC is still the #1 brand when it comes to cheap rotomolds, but their major downfall is they get backordered quite often – there’s a huge demand for them, but most people don’t want to wait three months after purchasing to actually receive their ice chest in the mail. 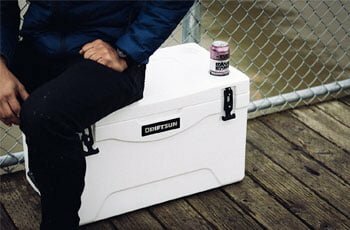 That’s why folks are always on the lookout for brands like Driftsun – they don’t care what logo is on the cooler, they just want to order it and get it in the mail quickly. Driftsun vs. YETI: Can They Compare at All? 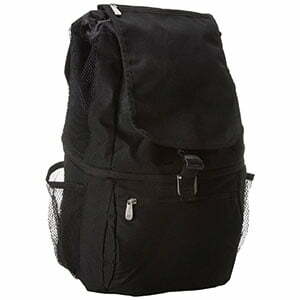 Whenever a new brand like this comes out, the first question is always: how does it compare to YETI? Keep in mind that there isn’t a ton of engineering that goes into building a rotomolded cooler – any company out there that can afford to invest in a mold and the right materials, can build a pretty darn good cooler. Like we mentioned in the review, Driftsun coolers have all the same integrated features as a YETI: 360-degree freezer gaskets, heavy-duty T-bands, rubberized non-skid feet, and a full 2” of industrial foam insulation. And actually, one of the major things Driftsun ice chests have that YETI’s do not, are built in cupholders in the lid. 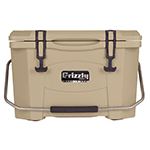 In our book this is an absolute necessity, and we don’t understand why anyone would build a cooler without them. 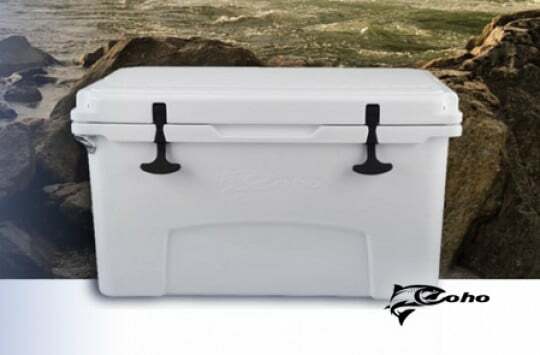 As far as overall build quality, Driftsun coolers really are nice, well-built ice chests – though they’re not 100% up to par with YETI, this probably just comes down to minimal differences in wall thickness, and/or subtle engineering features like how precisely the lid recesses down into the gasket. YETI has absolutely perfected all these little things over the years, so it’s tough for other brands to compare on every single level. However, though, let’s keep everything in perspective. Are Driftsun coolers nice? Yes. Will they hold ice for several days at a time? Yes. 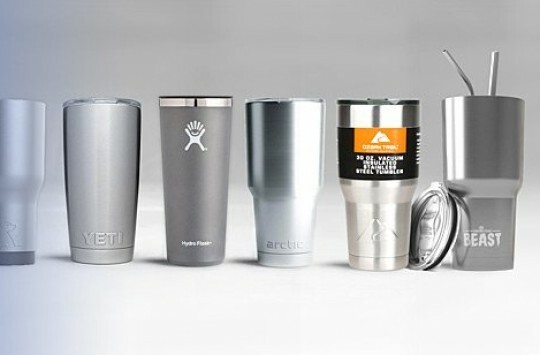 Do they have the ‘prestige’ that comes along with owning a YETI (if you’re interested in such things)? Mmm, no. Bottom line is, Driftsun is a surprisingly well made cooler – they exceeded our expectations, without a doubt. 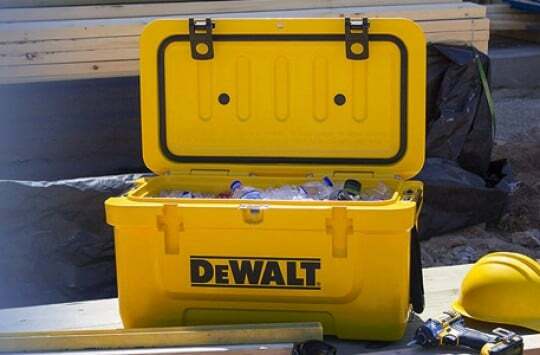 While they don’t seem to have a ton of experience making coolers yet, they’ve designed a pretty darn nice product technology and construction-wise. If you’re open to giving new brands a shot and you don’t care what the logo says on the front, (and more importantly, if you like saving a ton of money), definitely give Driftsun a shot. If you prefer going with the safer, well-established name on the other hand and want to enjoy a tried-and-true, reputable product, you’re better off going with the YETI. If you’re looking for a Driftsun cooler for sale, your best (and pretty much only) bet is to check on Amazon. At the time of this writing, they’ve got every size and color currently in stock for the best price online, and they’re offering free shipping on every size/model. And most importantly, you can check out what other customers have to say about the ice chests before making your purchase. All in all, we feel Driftsun Coolers is definitely a brand worth checking out. Similar to RTIC, they’re well made ice chests with smart, integrated features and the best part is you’ll save nearly 50% off compared to most of the top brands. Give them a shot this summer, and if you’ve got about an extra $2k to spend, maybe give one of their transparent kayaks a shot as well and let us know how sweet it is! We hope that this Driftsun cooler review was helpful for you and if you need more information feel free to drop us a comment below.